How long does it take to play a game? Anywhere from 75 minutes to two hours. Much depends on your style of play. If you like to mull over play calls, and/or keep thorough game notes and statistics, you'll be on the higher end of the scale, time-wise. If you make calls quickly, and keep fewer statistics, you'll be on the lower end of the scale. On average, about 90 minutes is a good time frame. Can this game be played solitaire? Yes, it's perfect for solitaire play! Can I create my own players and teams? Yes, there's a "How-To" guide available for a small additional charge that will give you complete instructions on how to create your own players and teams from readily-available football statistics. How long has this game been around? SECOND SEASON was introduced in the mid 1980s, and was first sold in the mid 1990s. Football game card sets range in price from $10 to $32, based largely on the number of cards in the set. *International shipping is extra. 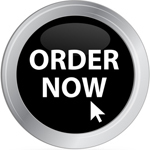 Please review the ordering information page before placing your order. Welcome to SECOND SEASON Pro Football Simulation Board Game, hailed by fans all over the world as the most true-to-life pro football board game they've ever played! 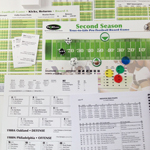 SECOND SEASON has been entertaining and engaging pro football board game fans since the 1990's. 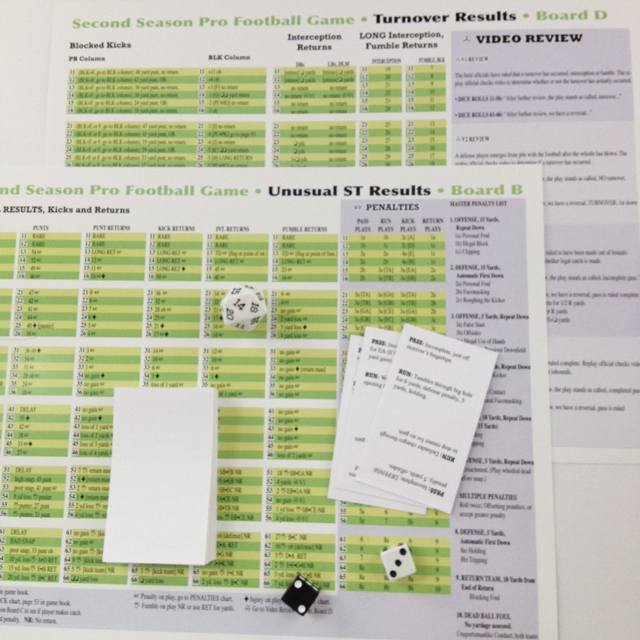 If you're new to the world of pro football board games, we'd like to encourage you to join in the fun, with SECOND SEASON Pro Football Board Game! Everything you'll need to re-create exciting, accurate, realistic professional football action is contained inside the SECOND SEASON Pro Football board game box. 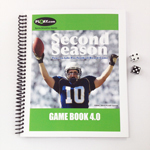 The heart of the game is the SECOND SEASON Pro Football board game book, a spiral-bound collection of charts which, when activated by a pair of ordinary, six-sided dice, produces results that are amazingly similar to real professional football! Read through a sample game play sequence. Watch a video review of SECOND SEASON. 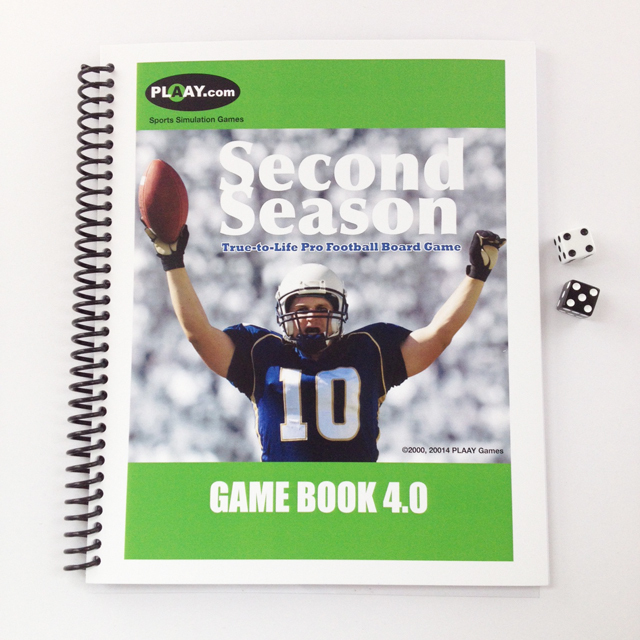 The game book is used in conjunction with yearbooks containing complete team-by-team ratings of players from a variety of pro seasons past and present. Each team is represented on its own "team card." 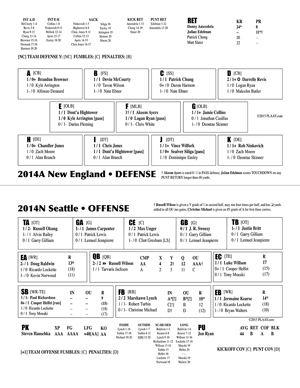 On the team card, each player--from all-star to third-string scrub-- is individually rated to reflect his own unique set of playing abilities, with all the necessary data arranged in a logical, easy-to-read manner. Together, these pro football board game materials allow you to enjoy real pro football action, using individual players and teams, anytime, anywhere! 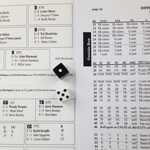 SECOND SEASON Pro Football board game is just like the real pro game! Quarterbacks, running backs, pass receivers, special teams players, linemen and defenders--in fact, EVERY player, from the All-Pros to the third-string rookie free agents--are each individually rated for their ability to contribute to their team's offense or defense. However, not only do the PLAYERS perform realistically, but the GAME ITSELF is meticulously designed to be an exact re-creation of contemporary professional football. Literally YEARS of extensive, game-by-game and play-by-play research of actual pro action were invested to ensure that gains and losses, penalties, fumbles, out of bounds plays, injuries and everything else that could happen in a real pro game has the same likelihood of occurring in SECOND SEASON Pro Football. Realistic player performances are only part of SECOND SEASON's amazing re-creation of pro football. 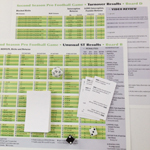 This football board game delivers true-to-life FOOTBALL, not just football statistics. Included in the text of the game book is the potential for virtually any kind of play outcome that could happen in a real pro game. Play outcomes can even border on the bizarre! For example, play can be temporarily halted while police remove an unruly fan from the playing field, or a quarterback can forget what play was called and have to waste a time out. 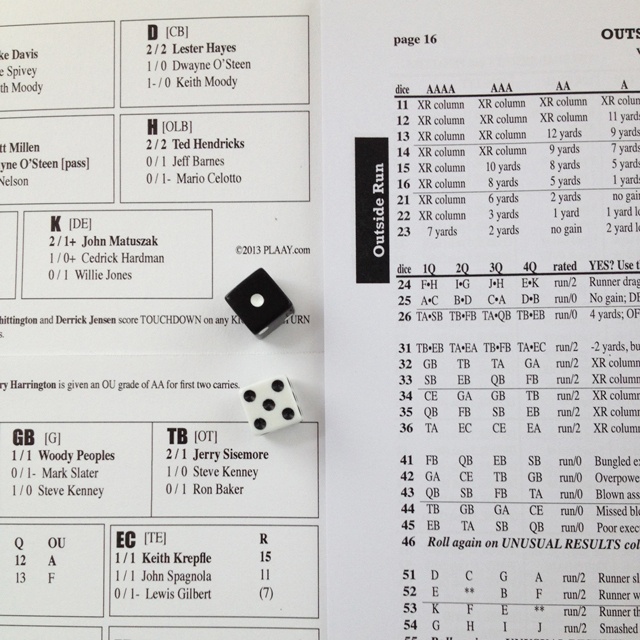 SECOND SEASON Pro Football board game also has a built-in home field advantage, which comes into play at various random times during a game. There's a provision for use of instant replay for video review of close plays, which you can choose to incorporate if you want to. And there's much more! Nothing has been left out in making SECOND SEASON Pro Football the most comprehensive and detailed simulation of pro football ever created! SECOND SEASON Pro Football board game was especially designed to be played "solitaire"-- that is, YOU, yourself, handling both teams. Yes, it can also be played "head-to-head," with two players coaching against each other. But if you're a football fan who doesn't have other people who share your table-game hobby interest, or if you're a table-gamer who just prefers solitude, THIS is a game that was especially created for YOU! SECOND SEASON Pro Football is a thoroughly engaging and endlessly entertaining solitaire football game! When you're playing SECOND SEASON, it feels like you're watching football on TV, NOT like you're playing a football board GAME! AND, with SECOND SEASON Pro Football board game, you don't have to depend on US to provide you with players and teams--you can make your OWN players and teams! We offer a player rating guidebook that gives you complete instructions on how to create any pro league season you want to. (You could even create college or high school players and teams!) Never before has a more customer-friendly game been offered than SECOND SEASON Pro Football! 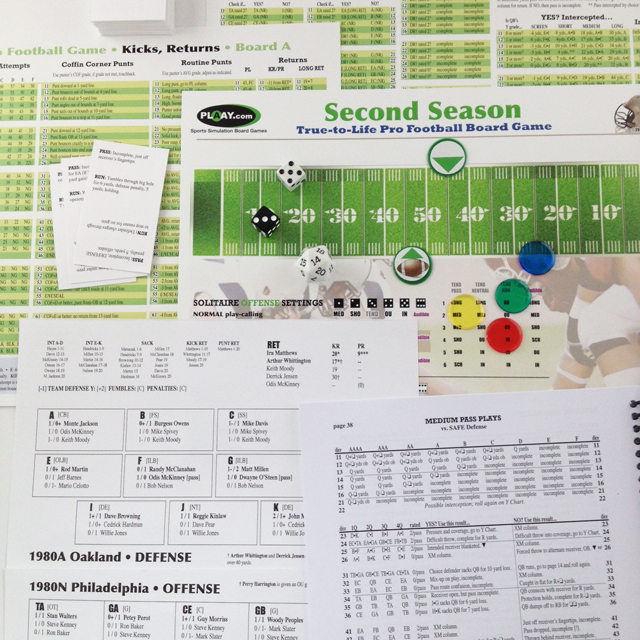 SECOND SEASON Pro Football simulation board game can be purchased for $49, postage-paid* and comes with four sample pro teams. Numerous full real-life pro and fictional seasons are available for purchase with your game. Are you ready for some FOOTBALL!? Order YOUR copy today! *International shipping extra, see ordering information for details.